The California Penal Code defines the unauthorized entry onto another’s land as trespass—a crime. 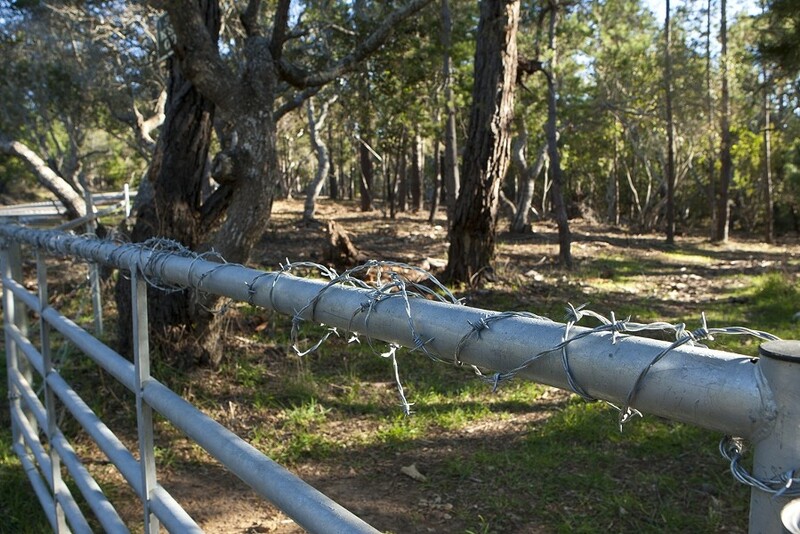 However, open and obvious acts of trespass, if sustained for a long enough period of time, can establish property rights to the underlying land. Adverse possession is a weird kink in property law, with origins centuries old. KEEP OUT : Landowners Ralph Covell and The Nature Conservancy closed this popular Cambria hiking trail earlier this winter. Also centuries old is a 200-acre stand of Monterey pine forest on Covell Ranch just outside the limits of Cambria—the largest privately-owned forest of its kind. Owner Ralph Covell bought the property 14 years ago and sold a conservation easement on his entire 1,458-acre ranch to The Nature Conservancy for $5 million in 2000. The nonprofit conservation group got $4 million of the purchase price from a CalTrans Transportation Enhancement Activity (TEA) Grant. Still, long before any of these developments, Cambria residents began freely walking along a trail traversing the forest, which became known locally as the Hansel and Gretel Trail. Public use continued until recently. A few months ago, someone strung a barbed wire fence across each of the forest trailheads and posted “no trespassing” signs. Now locals who have walked the forest for years are heaping pressure on owner Ralph Covell and The Nature Conservancy to reopen the trail. Farmer is one of several Cambria residents talking about litigating the trail access issue. They call themselves Neighbors of Open Space. The Neighbors believe they can document their use of the trail back 39 years to when the Phelan family owned the ranch for several decades. If the group can convince a court that this recreational use put the ranch owners on notice that the Neighbors held an interest in the land, that’s more than enough time under the California adverse possession statute to establish an easement right. Mike Conner of The Nature Conservancy responded that he didn’t know enough yet about Neighbors’ claims to go on the record about a potential lawsuit. He did, however, comment generally that the organization lacks the legal authority to unilaterally reopen the trail. Ralph Covell did not return multiple requests from New Times for comment. Contributing to the Neighbors’ beef with the trail closure is the fact that taxpayers helped fund the conservation easement. CalTrans contributed the $4 million TEA Grant using an amalgamation of state and federal transportation funds issued under the 1998 Transportation Equity Act. The program guidelines state that TEA Grant projects must enhance the transportation system in a way that provides a benefit and access to members of the public. Neighbors contend that The Nature Conservancy got what it wanted out of the deal and bailed on Cambria. “Now The Nature Conservancy is out of there, and we’re stuck with a problem that hasn’t been resolved,” Neighbors member John Kolgan said. Neighbors and The Nature Conservancy disagree as to whether the grant funding is conditional on adherence to the program guidelines. The Nature Conservancy once organized docent-led hikes through the forest, but stopped about five years ago. The Neighbors see this activity as proof that The Nature Conservancy regarded the guidelines as binding, whereas the organization called it a voluntary effort at community outreach. The third partner in the conservation easement, CalTrans, remains uninvolved in the controversy. The agency no longer keeps someone on staff to oversee the projects on a local level. The reasons for closing the trail are multifaceted. Last spring, San Luis Obispo County approved a controversial plan by Cal Fire to create a large firebreak around the forest using a machine called a “masticator.” The situation reignited long-held concerns that trail users could also be contributing to wildfire risk on the ranch. The Nature Conservancy also worries about the spread of invasive flora that might jeopardize the health of the understory and leave the stand further susceptible to fire and parasites. In addition to Monterey pine, the forest also contains a few reproducing Douglas firs—a Pacific Northwestern giant that hardly ever survives this far south. The other side to the story is that Covell placed his ranch on the market for $28 million in 2010, where it sat for 442 days before he withdrew the listing in January 2012. A proscriptive easement on the title record would certainly pose a problem for Covell if he tries to sell the property again. Neighbors of Open Space contacted a public interest firm in Santa Barbara about taking the case, but the group has not yet formally retained counsel.